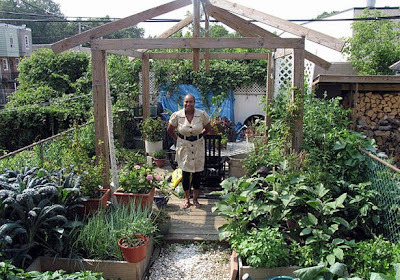 A recent Grist article by Tom Laskawy gives an informative overview of the urban farming going on in Philadelphia, PA, these days, spotlighting three urban farming organizations that are "putting Philly on the urban ag map": Weavers Way Co-op, Greensgrow Local Initiative for Food Education (LIFE) CSA, and the Pennsylvania Horticultural Society's Growers Alliance. In digging a little deeper into Philly's agricultural history, we found a great report by Domenic Vitiello and Michael Nairn of University of Penn's Penn Planning and Urban Studies Department, the 2008 Harvest Report. The report, though somewhat outdated now, still provides a fascinating and sobering look at the community gardens in Philadelphia (which are vastly different than the urban farms mentioned above in that, at least defined in this report, they are situated on land tended to by members of a community who do not own the land). What's most interesting to me about the report is the demographics of community gardens in Philadelphia. Concentrated mostly in low income neighborhoods, the gardens were (and some still are) means of providing fresh produce to friends and neighbors who otherwise did not have easy access to healthy food. Often, people brought knowledge gleaned from lives lived elsewhere -- both in and outside of the U.S. to seed choice and cultivation techniques. But many of these gardeners came from an older generation, without a younger one to take over. Diminishing numbers of gardeners, coupled with changes in the city's and community-garden-supporters' land use and economic situation led to a drastic decline in gardens since the 1990s. Nicole Sugarman, a co-manager at a CSA in the Roxborough neighborhood of Philadelphia, recently wrote another article about Philly's urban growers, looking at how much of the aforementioned history is obscured by the disproportionate media attention given to the "new poster child of the urban agricultural movement," a figure Sugarman sees as young, white and middle-to-upper class. As they say, any press is good press, but her advice should be noted: "For the urban agriculture and food movement to grow, we must acknowledge, learn from, and continue to support the work happening by all people in all areas of our city -- not just the 'trendy' neighborhoods, or when practiced by 'privileged kids' who get a disproportionate percentage of the attention, support, and ultimately credit for a series of activities and actions that far that far precedes me—work that has been done outstandingly well by others for a very long time." Labels: activism, anthropology, consumerism, Consumption Junction, education, food, green issues, health, Natural World, poverty, science, U.S. Thanks for shedding a little light on this. Growing vegetable is still a commune activity in Europe. Growing its own vegetable is part of life. My mother at 75 years old love working in her garden watching her vegetable and flower grow...she is in Belgium. It should be also part of American's live.